my shield and the horn of my salvation, my stronghold." Rock Solid is a for-profit local business based in Catskill, NY which collects and sells used clothing. Ninety percent of the clothing sold goes to third world countries such as Honduras, El Salvador, The Dominican Republic and several countries in Africa. The proceeds from these sales are used at home to benefit Christian Education. Most Christian Schools are without governmental funding, they depend in a large part on donations. 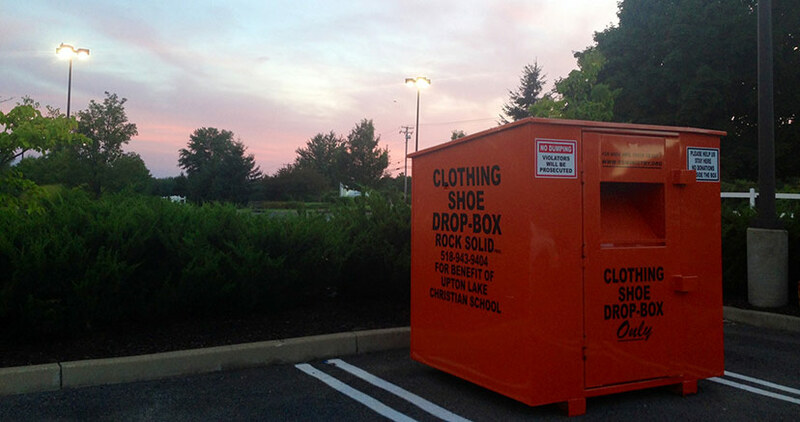 These orange drop-boxes also support other ministries world-wide, such as: Compassion International, Mission Aviation Fellowship and Kinship United. In 2012, they funded the drilling of a well in Africa, fed hundreds in a refugee camp in Sudan, sent emergency food and medical supplies to third world countries and fully funded two orphan homes in India. If you would like to help by putting a collection bin on your site, or if you know someone who would, please click here.